Commercial Concrete Waterproofing in NJ and NY | Adriatic Restoration Corp.
Commercial buildings and high-rise apartments can be battered by high winds, freezing rains, and even destructive sea sprays. Over time, the porous concrete of tenet’s patios, communal walkways, and structural walls can absorb water, salts, and contaminates that begin to deteriorate the aggregate cement materials. To help ensure a long life for their building, many owners choose to regularly waterproof concrete in NJ and NY. Concrete can be an extremely porous mixture of cement, sand, and paste. To extend the building’s usability, and ensure the occupant’s safety, owners and building supervisors are turning to modern means of concrete waterproofing in NJ and NY. The following are a few of the most popular waterproofing methods professionals recommend for commercial buildings. Sheet and fluid-applied membranes for foundations and walls. 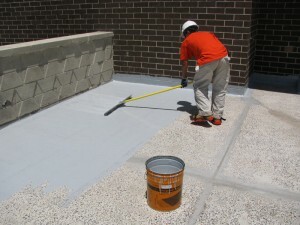 Urethane and elastomeric coating for decks and balconies. Sealants for crack injection sites. To ensure the concrete is waterproof is a difficult task and should probably be left to restoration experts that know how to waterproof concrete in NJ and NY. The team can analyze the situation and help building owners find the best solution for the type of harsh weather problems the building must endure. Concrete may not last forever, but by using a good waterproofing product, it can last a very long time.